Gold's big plunge may have only just begun. 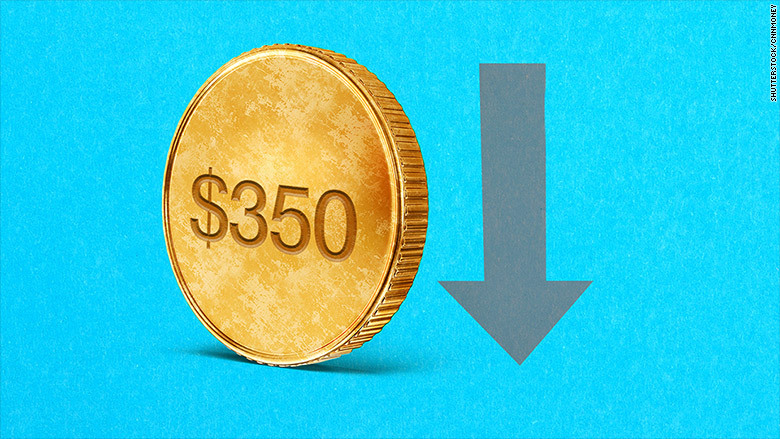 A prominent gold forecaster predicts the yellow metal will drop to a mere $350 an ounce, a level unseen since 2003. It's dramatically lower than what most experts are currently calling for. But Claude Erb's prediction might have merit. Back in 2012, Erb, a former commodities trader at TCW Group, co-authored a landmark research paper with Duke University professor Campbell Harvey that was early to predict gold's downfall. At the time, gold was fetching north of $1,600 an ounce. Now it's trading below $1,100. The paper used historical analysis to show that if gold is an inflation hedge -- as many people believe -- then it's extremely expensive at current levels. "Gold is no more or less volatile than stocks or anything else. It can be wildly overvalued, and it's very overvalued right now," Erb told CNNMoney. Gold could crash more: Erb and Harvey's research suggests that gold's fair value is about $825 an ounce. That would represent about a 25% decline from today's price. But gold tends to move to extremes before reverting back to its fair value. Gold prices, like stock and bond prices, are influenced by excessive levels of investor optimism and pessimism. "Markets rarely trade at 'fair value,' rather they tend to overshoot," Erb said. Their research suggests gold could tumble to about $350 an ounce before it goes back to fair values. Plunging that low would translate to an 80% crash from gold's peak price in late 2011. That's big losses for investors. Gold as an inflation hedge: Erb and Harvey's research is not concrete. Even if they're right that gold is overvalued, no one can say for sure when prices will correct. They could surge even higher before reversing course. In the past, the peak-to-trough cycle has lasted as long as 20 years. It's a long-term view based on the following hypothesis: Gold prices are driven by inflation, just like stocks are driven mainly by corporate profits. That belief in gold as the ultimate store of value is why prices spiked after the Great Recession. Investors feared the Federal Reserve's extremely low interest rates would unleash a wave of inflation and gold would protect them. 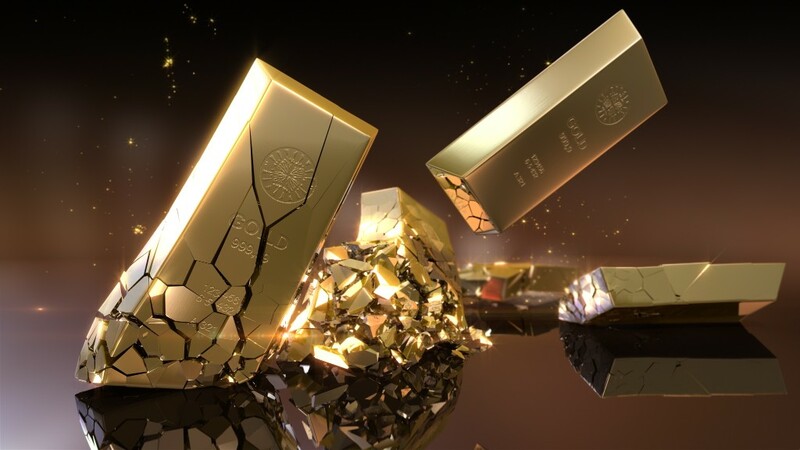 Erb and Harvey argue that if gold maintains its purchasing power over time, it stands to reason that its fair value, or inflation-adjusted price, should be constant in the long run. The authors used historical prices and a common measure of inflation -- the consumer price index -- to determine where that fair value lies. Of course, some believe that prices are driven by the amount of gold purchased by people in emerging markets like China and India. Gold plummeted earlier in July after a report indicated China has been consuming less gold than believed. Others argue gold prices are fueled by the cost of production incurred by mining companies. Erb sees little evidence supporting either of those theories, calling the latter "pretty close to ludicrous." 'Pretty far-fetched' But many others will see calls for $350 gold as ludicrous as well. "Clearly, it didn't go there," Alderman said. Wall Street turns bearish: There are signs that the smart money may be moving closer towards Erb and Harvey's view. Big Wall Street banks are slashing their gold price targets. Goldman Sachs (GS), one of the biggest cheerleaders of the commodities super cycle, recently predicted gold could tumble below $1,000 for the first time since 2009.